UHLC student Bryan Perez, 2L, left, Clinical Lecturer Rosemary Vega, Vanessa Garza, 3L, and Professor Geoffrey Hoffman leave the courthouse after appealing an asylum ruling. 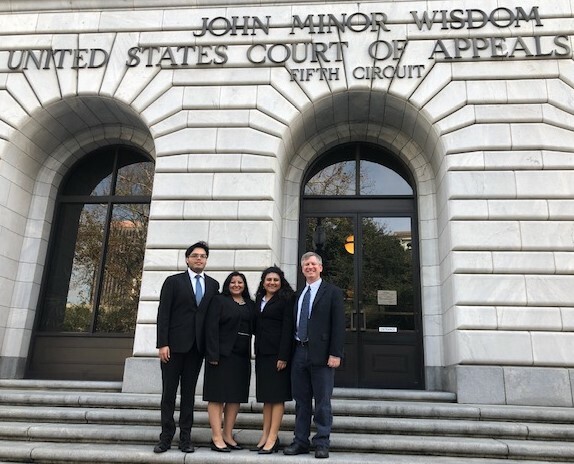 Feb. 7, 2019 — Faculty and students of the University of Houston Law Center Immigration Clinic collaborated with two other university programs to represent a young woman and her son Wednesday in an asylum case before the U.S. Court of Appeals for the Fifth Circuit in New Orleans. "The case involved a cutting-edge legal issue of asylum law: whether a litigant can clarify their particular social group on appeal," explained Clinical Associate Professor Geoffrey Hoffman, director of the Immigration Clinic. "The case may have wide-reaching implications for thousands of asylum applicants. Asylum is one of the most complicated areas of law and litigants need flexibility in articulating their social groups." The Law Center clinic has been working on the appeal for two years in partnership with the Harvard Immigration and Refugee Clinic and the Texas A&M Immigrant Rights Clinic. Hoffman, Clinical Lecturer Rosemary Vega, and two students, Vanessa Garza, 3L, and Bryan Perez, 2L, made final preparations at Tulane Law School the night before the oral argument which was conducted by Professor Fatma Marouf of Texas A&M. The court is not expected to issue its decision for several months.